Greetings All. I am a returning BMW Owner (previously a '71 R75/5) and purchased this bike to convert to a cafe racer. My primary ride is a '13 Triumph Thunderbird. I am excited to be back in the BMW family and will be actively searching for ideas for a custom build. It seems like a lot of trouble just to get a date. Will the build involve a meal plan and a gym? I am currently collecting part to convert a standard seat k75 to a low seat configuration for my wife. I could not help but notice that the look you are going for is a k100. SO before you do anything drastic would you be interested in trading your 75 for one of my k100 (I have a 87 rt and a 88 lt) that are good runners but have tired fairings. Or if you want to stay with the 75 would you like to sell the seat and hardware? BTW I live 60 miles north of Pittsburgh. Most kustom k's end up half baked and moldering away behind the shed. Their most notable contribution to motorcyclery is to keep a healthy supply of various parts on Ebay. Welcome! That's a nice looking K75. Add some dropped S bars and leave it as is - that's a rapidly appreciating classic! Or swap it w/ someone on here w/ a bike or bikes that will get you on your way, w/o having to cut up an original. Win/win! Either way, good luck, and ride safe! Nice Triumph, too. Thanks for all the feedback! I know there are two camps: those that hate modding a classic and those than embrace them. The bike was delivered this morning. After a quick, illegal cruise around the neighborhood, I am leaning towards minimal mods. I like it way more the way it is than I thought I would. Any decision I make will be a year or so away. I love my Triumph, hated to sell my /5, and really am happy to be in the BMW camp again. Sounds like a nice ride! 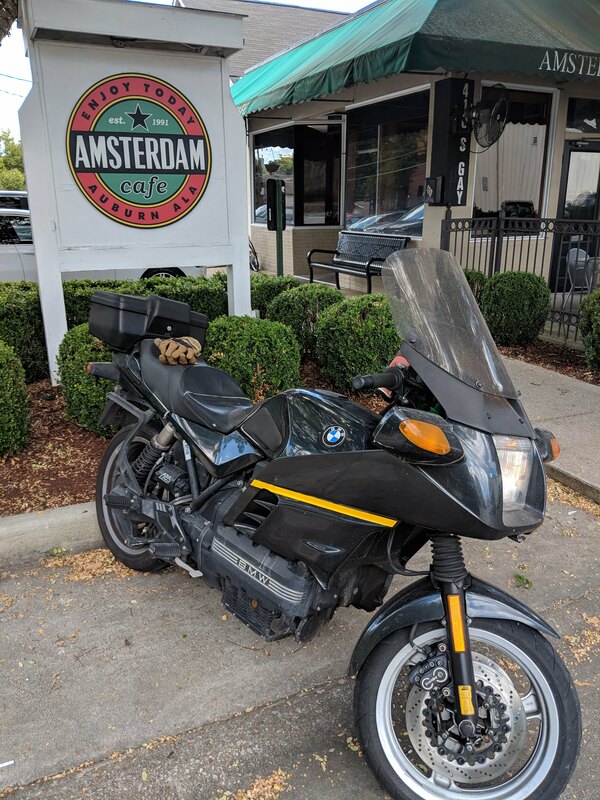 Look into some drop bars if you want cafe style positioning, and w/ that small cafe-style fairing, it'd be a nice look, in my opinion. But, it's your ride - build it and enjoy it! modifying a clapped out classic that needs saving...ok.
modifying a pristine example of a classic...not so much. Interesting fairing. Not sure what it is but I think I like it. Don't roach the bike! I also owned a /5 (R60/5) with a toaster. I violated it by stringently waxing my chrome...sidecovers also ;) I regret selling the bike, but have replaced it with another classic! Hmmm, does look a tad clean for a garage date with the angle grinder, but hey, this is your gig. Just realized it has a round headlight - maybe that fairing/light combo is adapted from an R-bike? Either way, looks really cool! I'm digging it! Does that bike really have 9300 miles on it????? Yep. Garage kept, clean as a whistle. 9300 original miles. I was lucky to find it. I just got a little shiver.